No company has cracked the code for choosing the best chemotherapy for an individual patient, despite the broad range of molecular breast cancer tests available today. Trial-and-error is still the mainstream available path. Currently, the majority of patients start their treatment journey with the ‘standard-of-care’, taxane-based regimen. Due to the low response rates to this regimen (25%), when patients are offered the next level of treatment they have already been exposed to side effects for about six months, which is painful for patients (e.g., immune system debilitation, nausea, hair loss and exposure to unnecessary toxicity). Imagine if we knew who was a good candidate for the ‘standard-of-care’ and who should go straight to ‘Plan B’ while their immune systems are still strong. 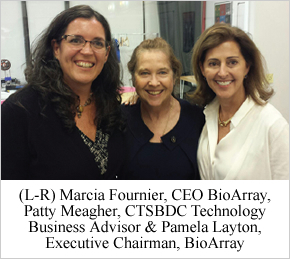 Enter BioArray Genetics, the Connecticut SBDC’s (CTSBDC’s) own cancer revolutionary. Chemotherapy is not a “one-size-fits-all” process, and precision medicine was Marcia Fournier’s inspiration for founding her biotech company, BioArray Genetics. Marcia’s extensive experience in oncology, as well as her practical and strategic experience in drug discovery, biomarker development, and clinical diagnostics, led to the development of BioArray’s first predictive test (BA100). It saves breast cancer patients potentially life-saving months, by pinpointing the best chemotherapy treatment for each patient based on genetic markers right out of the starting gate, while the patient’s body and immune system are still strong. Ineffective and unnecessary treatments cost the U.S health care system $2.6 billion annually, waste precious time, and can cost people their lives in the process. BioArray Genetic’s first innovative RNA-based predictive test identifies which breast cancer patients will have a complete response to pre-surgical chemotherapy, resulting in more than a 55 percent reduction in wasted treatments and a 68 percent improvement in response rates — not to mention its cost-effectiveness (the BA100 reduces the average cost of treating a patient in half, from $24,000 to $12,000). By properly identifying patients that will not respond to ‘standard-of-care’ chemotherapy, BioArray’s predictive test enables physicians to make the most beneficial and efficient decisions possible, and allows them to optimize and customize treatments for their patients, enhancing outcomes and reducing costs simultaneously. Its unprecedented gene platform provides the broadest coverage of cell signaling pathways and drug associations to date. Because of this, BioArray is a valuable and robust complement to other gene platforms in the cancer drug research and development process. With some well-timed help from the CTSBDC, the company was able to round out its investor pool and complete its Series A round of funding. Patty is on the Board of Astia and a member of the CT Angel Investor Forum, which is helpful in facilitating investor connections. Helping entrepreneurs navigate the mercurial waters of fundraising is what Patty spends the majority of her time doing as an advisor. She would be the first to say that entrepreneurship isn’t a solo act — it requires a team and it takes a lot of people opening up their personal networks to help startups along this journey. BioArray brings products from bench to bedside, and the company is on its way to transforming cancer treatment and saving millions of lives, starting in Connecticut. To learn more about BioArray, visit bioarray.us. To learn more about the Connecticut SBDC, visit ctsbdc.com.